If you read our blog post written by our administrative intern, Keran Gounieaud, you will remember that he mentioned he came to Bournemouth through the Leonardo project. The Leonardo Programme was part of the EU’s Lifelong Learning Programme but the Erasmus+ has now replaced this programme. The objective of this programme has always been to support vocational education and training (VET), staff and learners to work together on improving training to enhance employability in the future. Keran wasn’t the only student who was given this brilliant opportunity to get work experience in the UK. 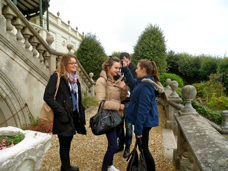 In fact, we at WCE welcomed around 17 students in October from Paris and Cognac. The group from Paris specialised in IT & Engineering and were the first to arrive in Bournemouth and start their 5-week adventure. The group from Cognac specialised in administration. They both had an intensive English course during their first week and also had some booster English lessons here in our Social Room. Teaching the groups in the Social Room was sometimes very chaotic but it was certainly never boring. Each group showed their excitement in their own way be it by deciding to randomly do push-ups half way into a class or taking photos. To be fair, even I jumped on the selfie bandwagon but I soon got serious where others seemed to take a little longer to come back down from selfie la la land! At times this was frustrating for myself who was teaching and other students who were serious about improving their level of English before their internship began. All in all, the first week gave them an insight into how this would also be a life experience for them. I mean working or living abroad can be one of the most life changing experiences you can have. Being out of your comfort zone i.e. home, opens your mind and forces you to grow no matter what, so as well as being a life experience, their 5 weeks’ stay in Bournemouth also served as a learning curve. Although they did not speak very much English during their first week as they should have in their lessons, I, as their teacher, was comforted by the fact that they would be forced to speak English in their working environment, simply because they would be separated from their peers. I have always been a believer that the best way to learn a language is to fully immerse yourself in it, and trust me I know. It’s scary at first and speaking in your native tongue is the easiest option but sometimes you just have to dive straight in. Initially you may think, “But what if I fall?” but the popular saying would go: “Oh, but darling what if you fly?” Speaking a new language is risky but getting out there just brings you better results. It takes confidence sometimes but I knew that most of students in both groups had the confidence to take the plunge into the unknown. The Cognac group will be leaving this Saturday and we wish them and the Paris group all the best in their future. We are certain that they have grown as individuals in a number of ways during the last five weeks and that they will forever remember the imprint that this experience left on their hearts. In fact, perhaps this has encouraged some to continue learning English or even contemplate living abroad in the future – Who knows? Below are testimonials written by two of the students, one from Cognac and the other from Paris. 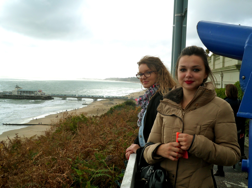 “I spent a very pleasant stay in Bournemouth. The trip to the Oceanarium was very interesting and really beautiful to see. My internship at Europa went well, I learned a lot of things and I improved my English.” – M.C, Cognac, France. “I had a good experience in England. My English has improved. I loved the initiative to teach English to students. I really loved my internship because I learned a lot from my boss, of course. I was a good student during my internship and my boss enjoyed working with me,” M.G, Paris, France. We were so pleased that the students enjoyed their all-round experience here because that is what this programme is all about. Providing students with valuable work and life experience abroad that will help them in their future. By worldchoiceeducation in How we help you, The UK, World Choice Education on October 24, 2014 .